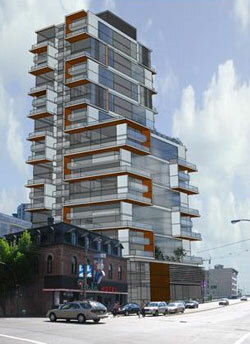 The rebirth of Midtown Vancouver real estate community by Rize Developments is happening sooner rather than later at the recent release of the plans by this local developer to build a mixed use retail/residential building at 1300 Granville Street in downtown Vancouver. Called The Rolston Vancouver condos for sale, this striking and beautiful condominium tower will grace the Midtown Vancouver real estate community with another flagship development by Rize. The pre-construction Vancouver Rolston Condos embraces the past while pointing the way to the future of this wonderful area. Situated in one of the last heritage properties in the downtown Vancouver real estate core, in the midtown district, this new Rolston Vancouver condo high-rise residentiaul tower incorporates both cutting edge design features and much needed single room accommodations that are both affordable as well as very high-end for the price point and location. The dynamic heritage revitalization which reintroduces the gateway to Granville Street, once the booming hub of this growing city, will provide spacious downtown Vancouver condo living in a great setting. The pre-construction Rolston Vancouver condos for sale will provide breathtaking views from expanded decks and balconies, great bonus density and a vibrant arts center within the complex as well. Destined to become the next downtown Vancouver condo landmark building, the midtown Rolston condominium tower is more than a residential building, but an actual modern living center that embraces cultural diversity, revolutionary floor plans and urban rejuvenation. The opening date for The Rolston Downtown Condo Pre-Sales Event is right around the corner! As a Downtown Vancouver Rolston VIP Registrant, we would like to invite you to our VIP Opening on Saturday, May 1st at 10 am. Each pre-construction Downtown Vancouver condo suite at The Rolston Midtown Condominiums has been designed twice: The Yale and Cecil Editions. Two different interior Rolston floor plans for the same suite reflect two different living styles. In addition, we offer three color palettes for you to choose from. Click here for more information regarding The Rolston pricing, floor plans, deposit structure and construction timeline. With a scheduled completion this year in 2010, Rize Developments has embarked on an ambitious plan to transform the midtown Vancouver downtown real estate district into an urban and electrifying area to play and live. Located at 1300 Granville Street, Vancouver Rolston condos for sale will be well situated withing the downtown core, at the edge of the business district, Yaletown and the West End, making public transportation, services and amenities easily reachable. This mixed use development at The Rolston Vancouver condos for sale features a total site area of twenty thousand square feet in addition to floor area of one hundred and eighty five thousand sqft. The high-rise tower at The Rolston Vancouver condos will be twenty three stories in height and will feature a wide range of unit floor plans that are yet to be released. The residential component to the Rolston Vancouver condo site is about 165,000 sq ft of living space as well as twenty thousand sqft of retail space. The developer for the midtown Vancouver Rolston condo tower is Rize Alliance Properties Ltd that is located at Suite 320 -1085 Homer Street, Vancouver, BC - Tel 604 681 6723 | Fax 604 681 7505 | www.rizealliance.com. In addition, if you would like more information about the Rize Rolston Vancouver condo development, you can reach them by email at info@rizealliance.com as they have started marketing the property. Priority registration is now underway for a very unique opportunity in the downtown Vancouver real estate market. To be located on the site of Vancouver’s historic Cecil Hotel, the Rolston Condos will be a 23 storey LEED Gold high-rise condo residence adjacent to the revitalized Yale Pub, a longtime musical mecca for rhythm and blues. All 185 pre-construction Vancouver Rolston condo residences in this glass and concrete condominium tower will offer oversized, view balconies. The Rolston Vancouver Condo towers’ presentation centre and display suite is located at 999 Seymour Street, and will be ready for March 1, 2010, when presales are expected to begin. For more information and to register, please visit therolston.com today. The neighbourhood of Drake Street and Granville Street in downtown Vancouver real estate market place is about to change big time! Located on the site of Vancouver’s historic Cecil Hotel, The Rolston Condo tower will bring a fun loving, avant guarde and spectacular new design architecture to the downtown Vancouver real estate community. As the new Granville Island North, this area will soon become the next Yaletown too! The Rolston Vancouver condominiums will feature a total of only twenty three floors of boutique downtown apartments for sale, with only 186 suites. The West Coast open concept floorplans and design incorporate pull backs from the exterior walls to dramatically increase your day to day living space. The downtown Vancouver Rolston Condos’ presentation centre will be opening in March 2010 at 999 Seymour Street, Vancouver, so to get the latest grand opening details, pricing and floorplans, please register your interest online at www.therolston.com or call 604.688.8927.